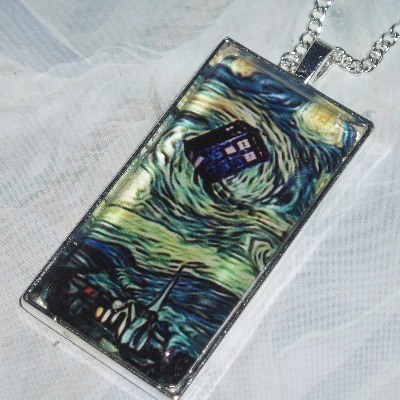 Domino size handmade glass van Gogh style photo cabochon of the Tardis on a starry night, set in a silver plated pendant tray. Very Geek. The Doctor and Amy work with van Gogh to defeat the Krafayis, but in their attempt to have van Gogh realise his legacy through bringing him to the future they ultimately realise that not all of time can be rewritten and there are some evils which are out of the Doctor's reach.